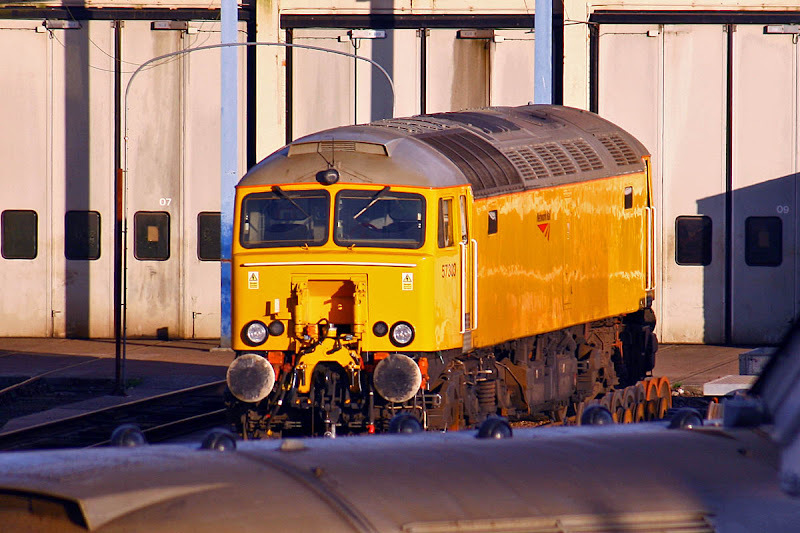 47841 at Eastleigh Works, 27th April. Most of the numbering, and the DRS web address have been removed. Serck shutters have been in this state for some years. 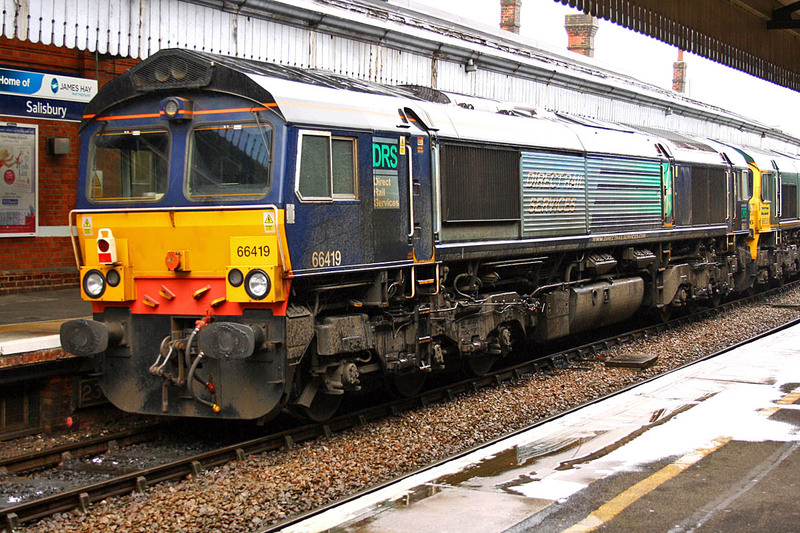 57303 at Eastleigh Works, 27th April. 60092 St Denys, 6B43 09:38 Eastleigh - Western Docks, 23rd April. 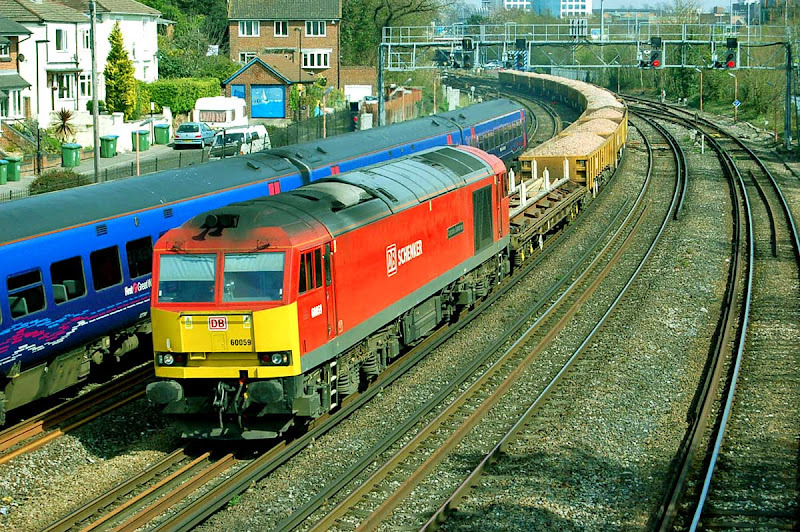 60092 Millbrook, 7V41 14:45 Eastleigh - Westbury, 23rd April. 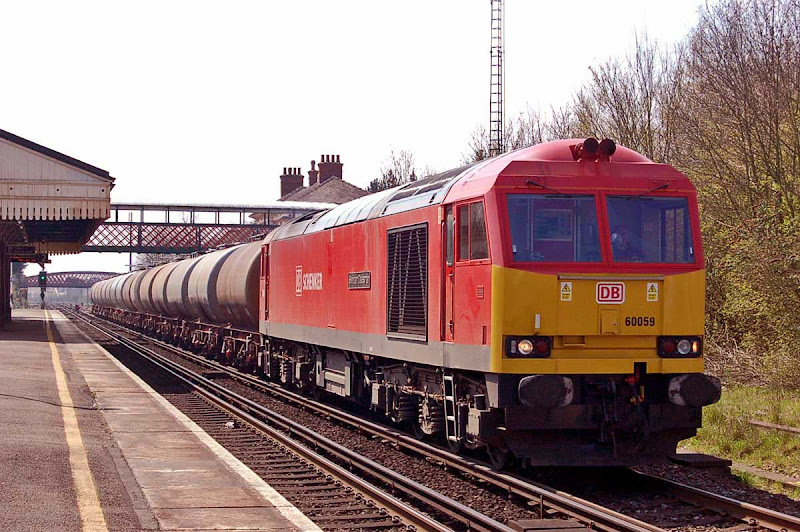 60059 6V41 14:45 Eastleigh - Westbury, 25th April. The Watercress Line Diesel Gala had plenty of interesting guest locomotives. 20087, new in September 1961 to Eastfield, from Robert Stephenson & Hawthorn, Darlington. 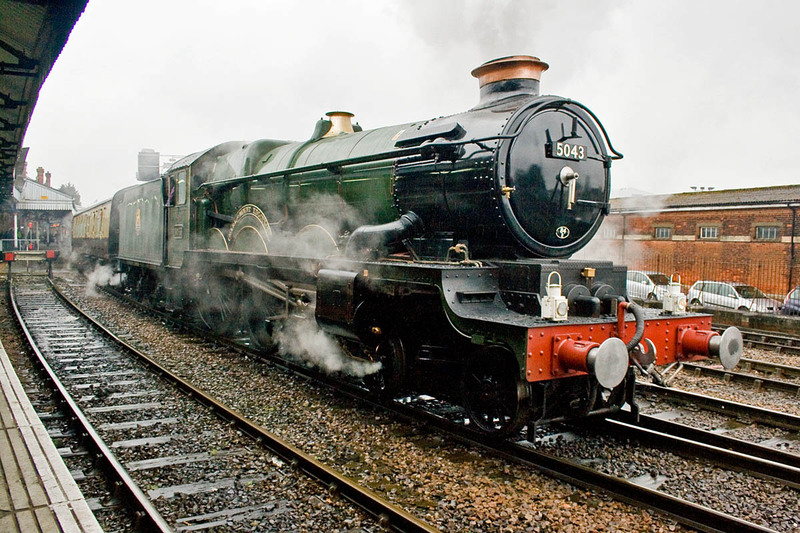 Preserved on the East Lancashire Railway. 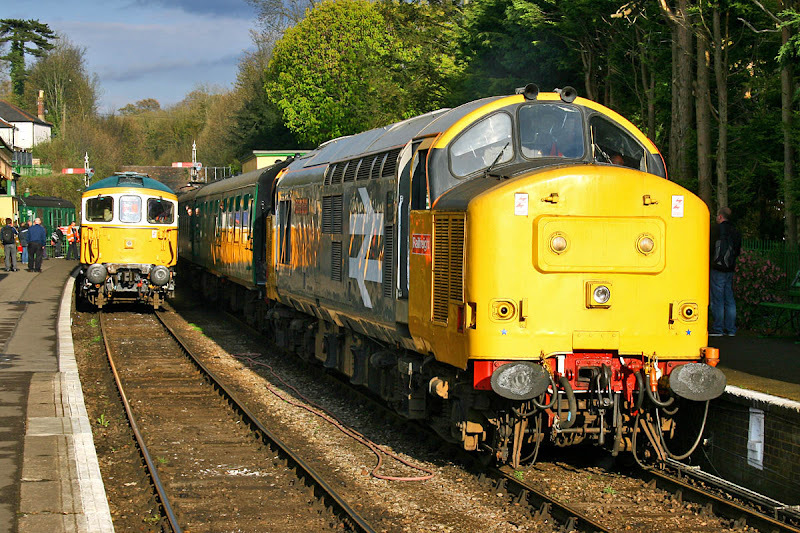 45132 on the left. 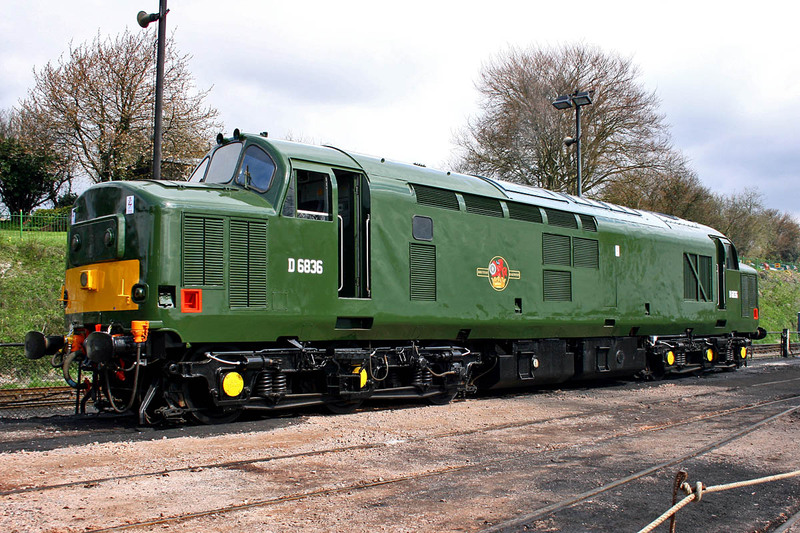 37905 newly repainted in green by Nemesis Rail at Burton, and returned to the Mid-Hants on Thursday 25th. New 50 years ago in April 1963 fromVulcan Foundry, allocated to Cardiff. 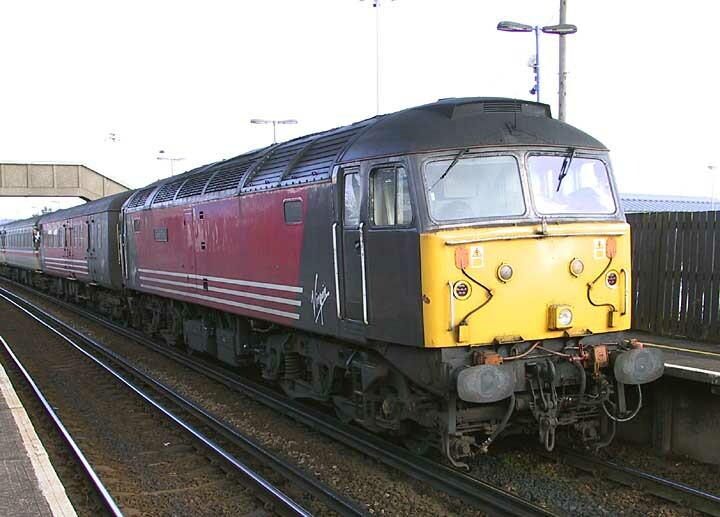 Re-engined in 1986 with a Ruston RK270T of 1800 hp. 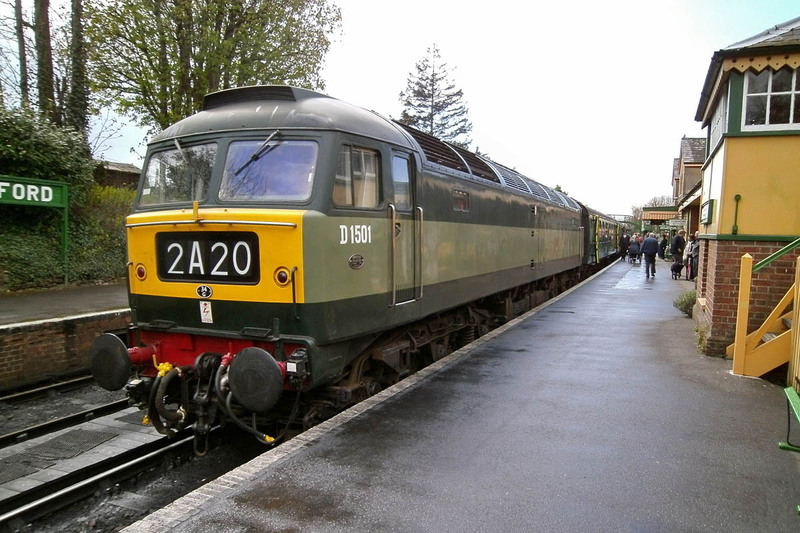 55009 (D9009) Alycidon leaves Ropley with the 2A04 09:45 from Alresford. New in July 1961 to Finsbury Park, withdrawn on 2nd January 1982. 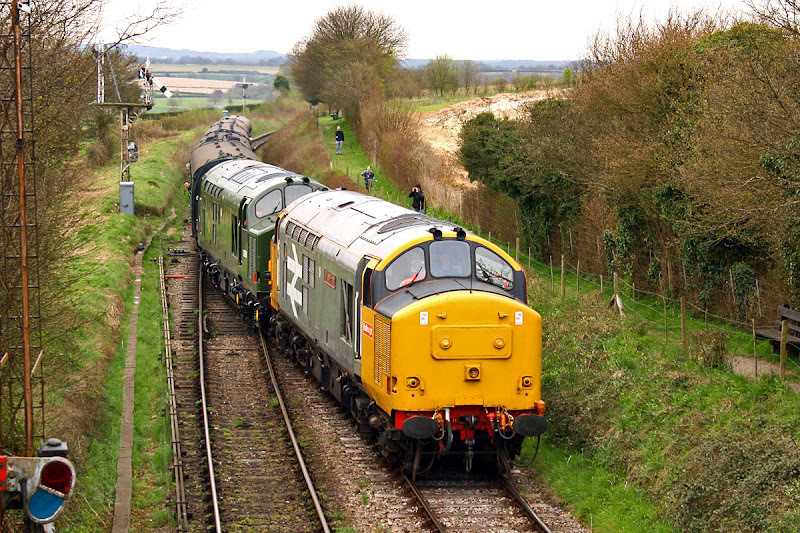 Doubled Headed Slugs 37901 + 37905 approaching Ropley with 2A12 12:25 from Alresford. 37901 Mirlees Pioneer was new as D6850 to Cardiff in June 1963. 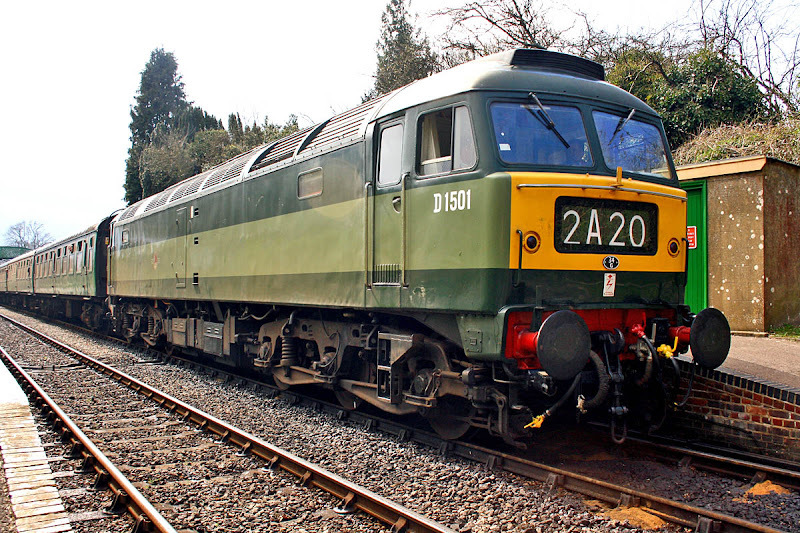 47402 was the second class 47 built, delivered as D1501 in November 1962 to Finsbury Park. 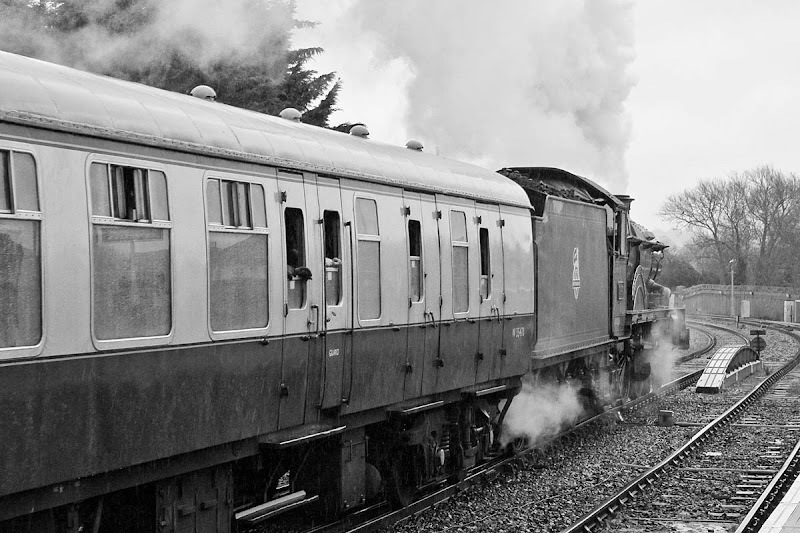 Running with 2A20 15:05 from Alresford, paused at Medstead. 37901 arrives at Alresford with late running 2L25 17:30 from Alton. 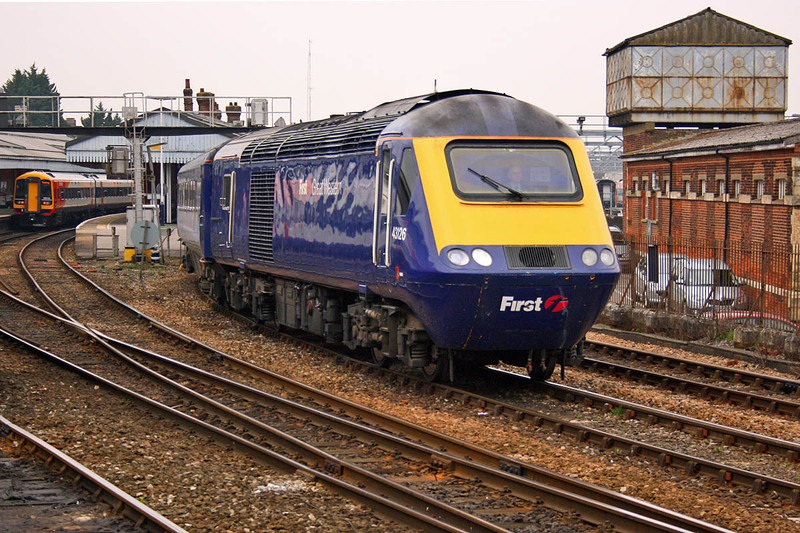 33109 had failed in the platform, and was being removed by 50027. 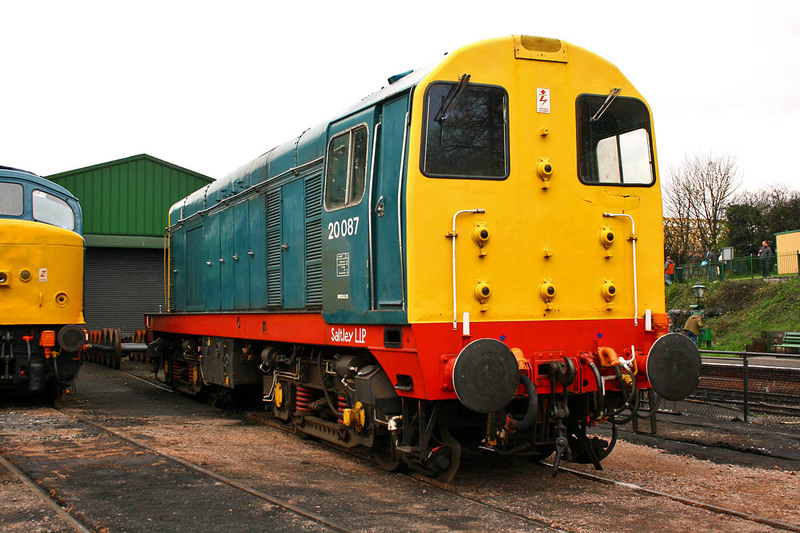 37901 was rebuilt in 1985 with a Mirless MB275T, with increased height roof-line. A full set of pictures is located here on SkyDrive. 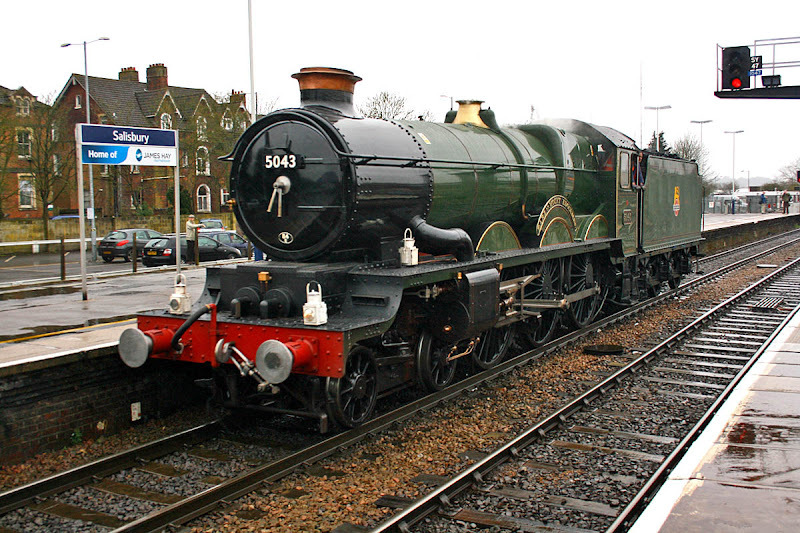 47402 prepares to leave Alresford on Friday with 2A20 15:05 to Alton. Image by Chris Finch. Three images from David Mant. 47712 Lady Diana Spencer at Salisbury with a West of England NSE train, 8th December 1991. Manchester Piccadilly, 26th July 1999. 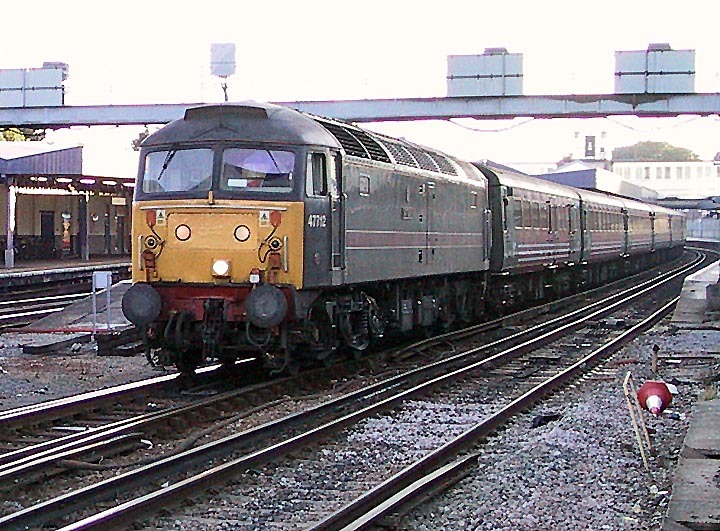 Bristol Temple Meads, 15th April 2000. 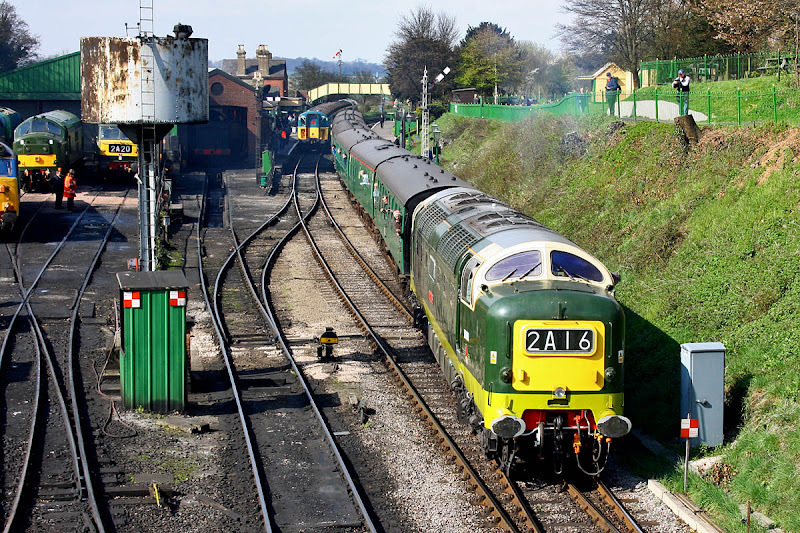 45379 demonstrating the new vantage point at Ropley, 10th March. Image by Ian Knight. 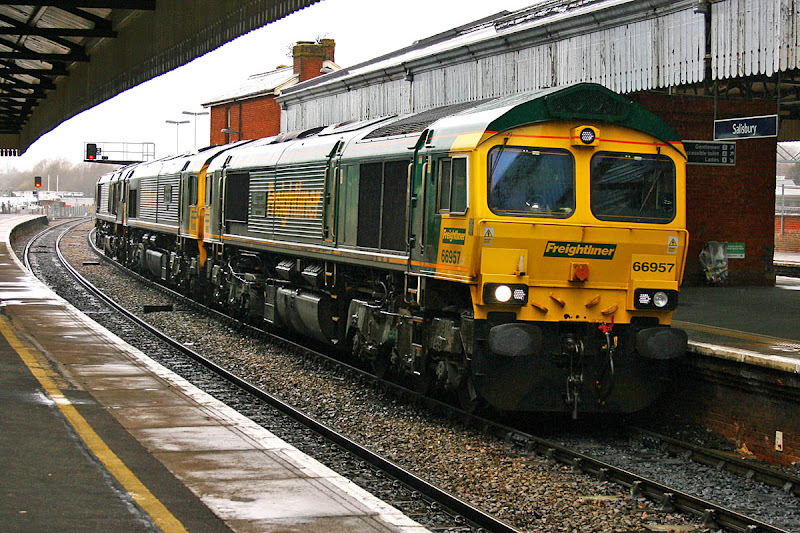 70016 hauls 70020 DIT at St Denys, 12th April. Image by Ian Knight. 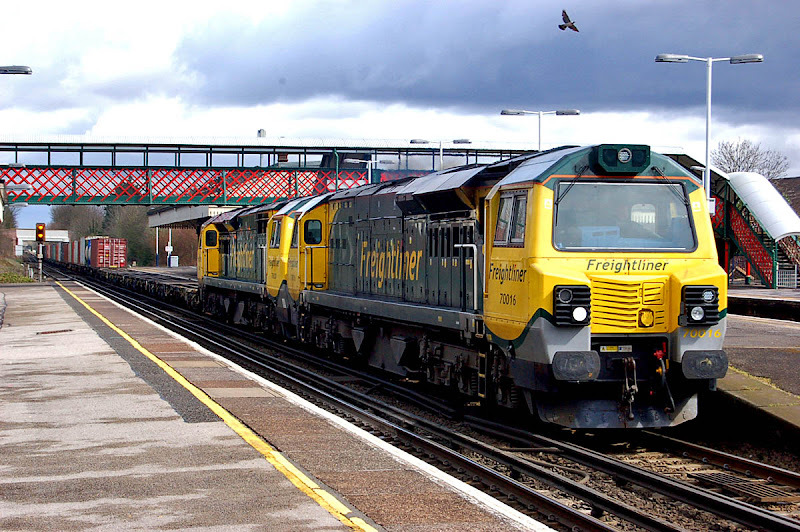 66957 + 66526 + 66419 running as a Stoke Gifford - Eastleigh convoy, at Salisbury, 13th April. 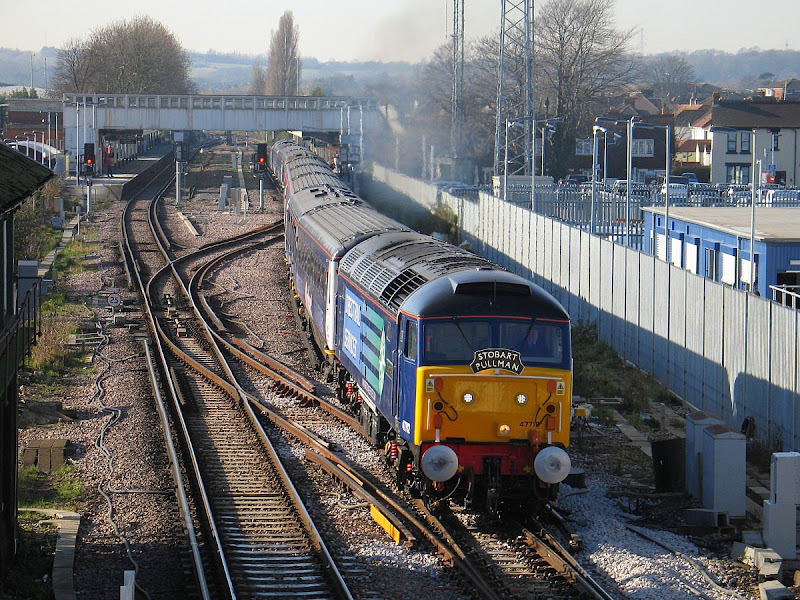 37425 did run to Exeter on Friday 5th, returning 6th as 3Q04 23:03 Eastleigh - Eastleigh - Redbridge - Salisbury - Exeter - Salisbury - Romsey - Eastleigh. 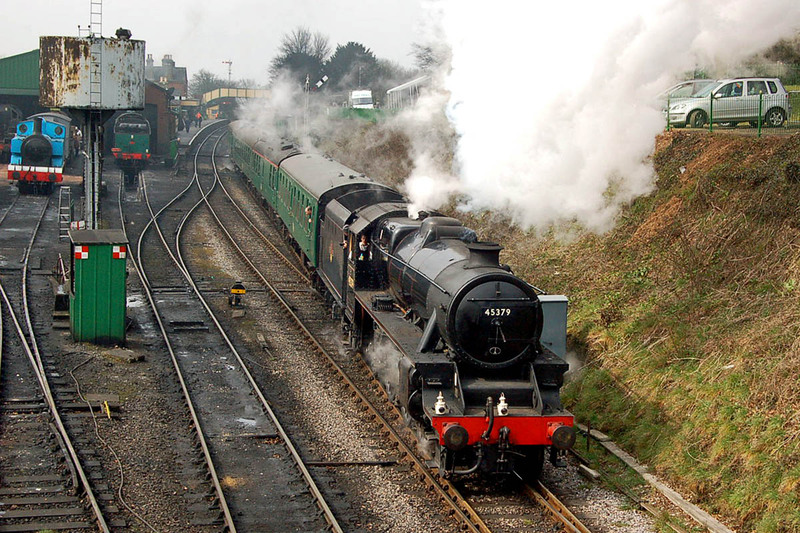 "The Moonraker" 1Z76 07:05 Solihull - Salisbury, 1Z77 16:05 Salisbury - Solihull, promoted by Vintage Trains, and hauled by 5043 Earl of Mount Edgecumbe, built at Swindon in 1936. Arriving at Salisbury 8 minutes early. Pushing the stock back to the East Yard. Returning to the stock having been turned and watered. Departing with the return journey, which arrived only 2 minutes late at 20:20 at Solihull. 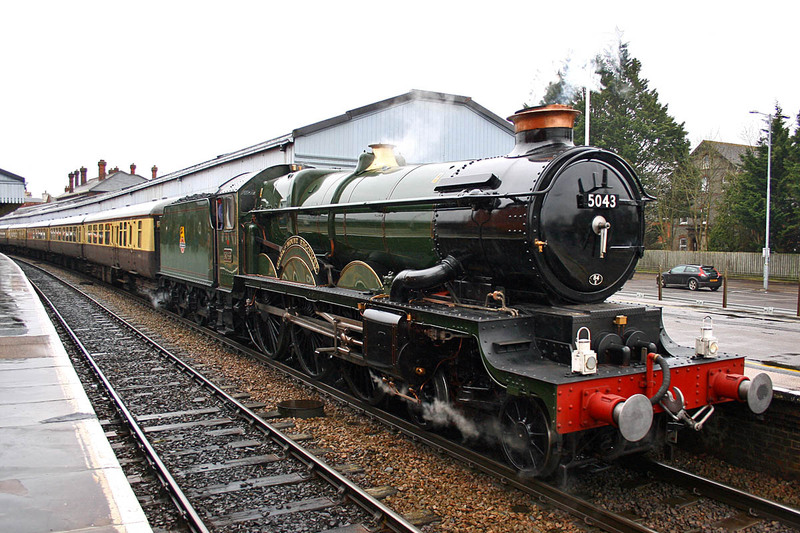 47712 is now a preserved locomotive! The DRS disposals continue. 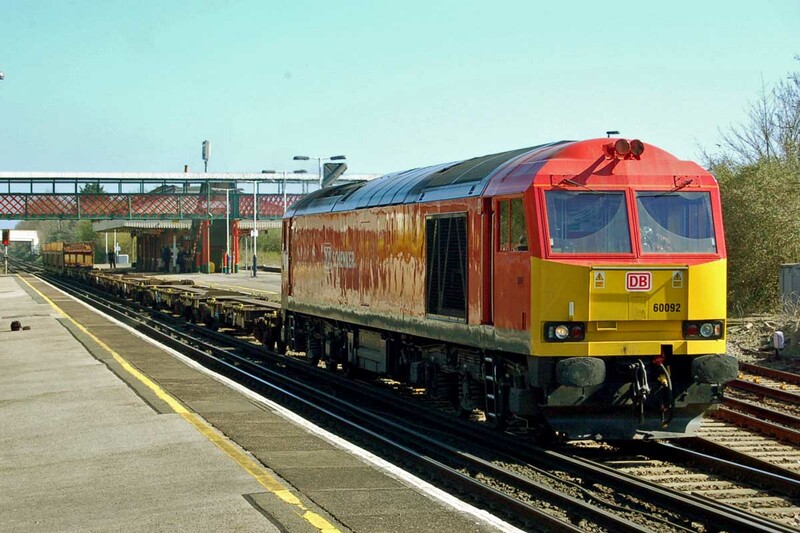 Recently 47712 was moved from pool XHSS DRS STORED LOCOS/LHCS to MBDL, which is the pool PRIVATE OWNER - DIESEL LOCOS and this did cause me to raise an eyebrow. All has been explained on 6th April, with the debut of 47712 in preservation at Crewe Heritage Centre, in the hands of newly formed Crewe Diesel Preservation Group. 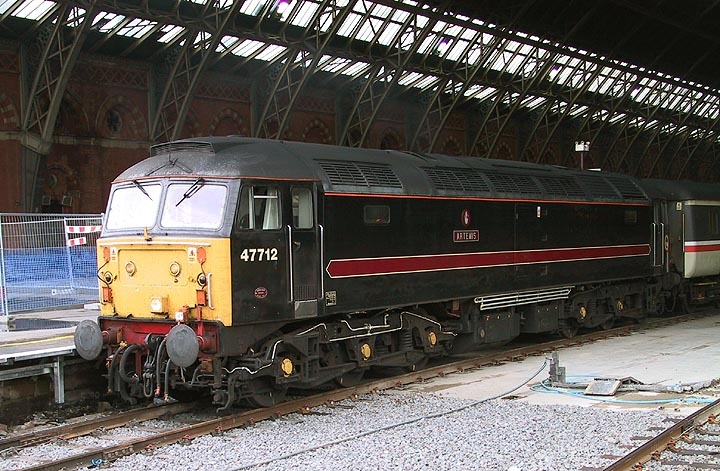 In Fragonset ownership, 47712 ARTEMIS at St Pancras, 8th August 2002 (1F48 17:25 St Pancras - Sheffield). Earlier, in the longer evenings, it was possible to photograph this evening Virgin Cross Country working at Southampton, with ECS return to Old Oak Common. 26th May 2002 after working 1O19 17:06 from Birmingham New Street. 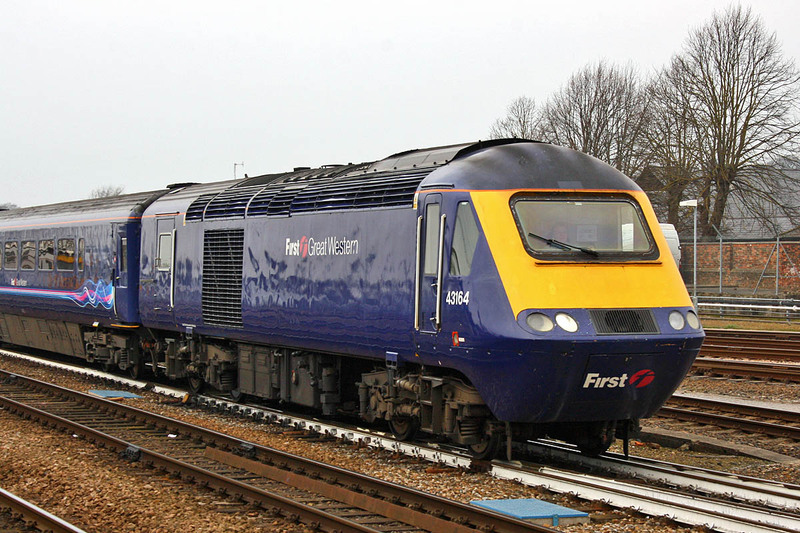 At Salisbury, 14th February 2006 in Blue Pullman colours. In DRS ownership by 12th February 2008, and pulling the short lived 'Stobart Pullman' at Havant. The Pride of Carlisle nameplate had been unveiled the previous day. 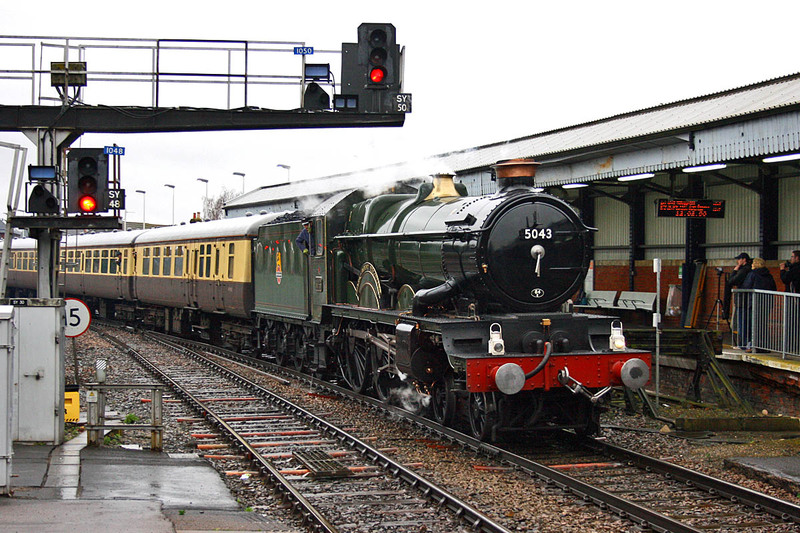 In 2009, 47712 spent a long time in and around Eastleigh Works, here seen at the open day on 24th May 2009. 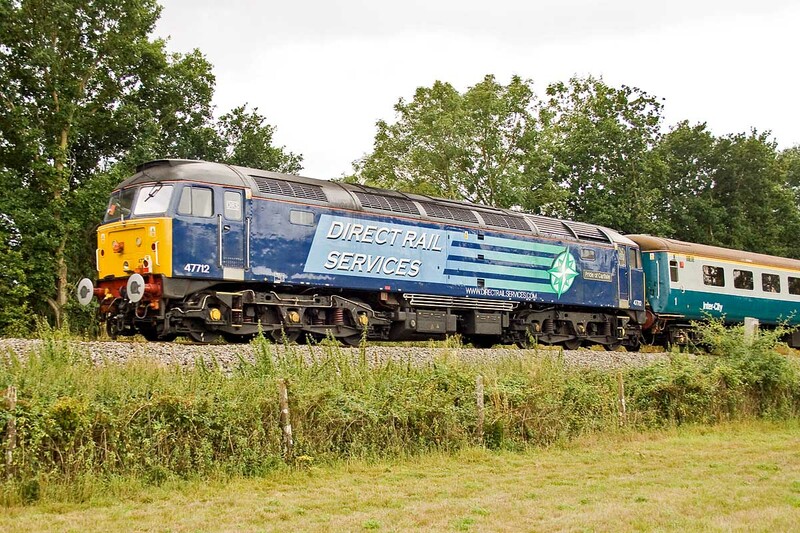 On the rear of a charter formed from Cargo-D stock, 47712 is passing Crampmoor, 14th August 2010. 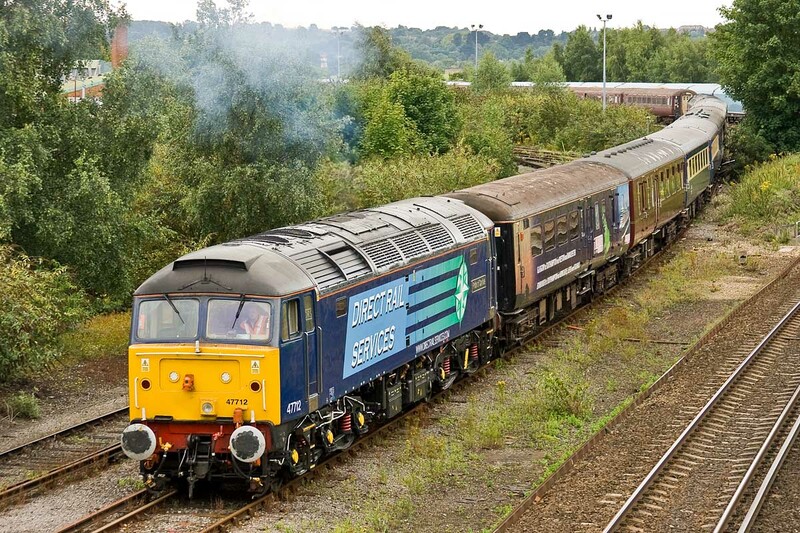 On 13th August 2011, 47712 is seen easing the Cruise Saver stock out of the carriage sidings. This was the locomotive's last visit to this area, as it was stored in the following days - amongst other things, it had low tyres. 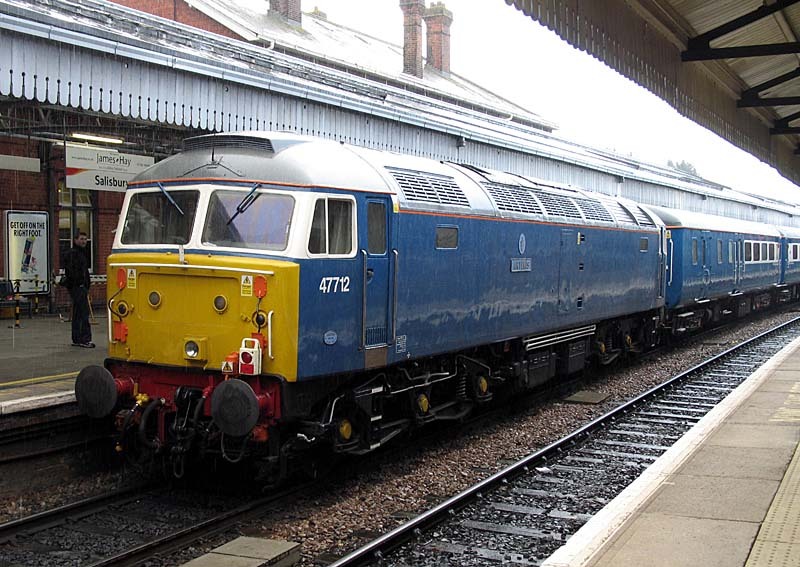 It worked north from Southampton on the 14th with this train, then a Chester - York - Crewe 'Northern Belle' charter on 17th, after which it was stored. 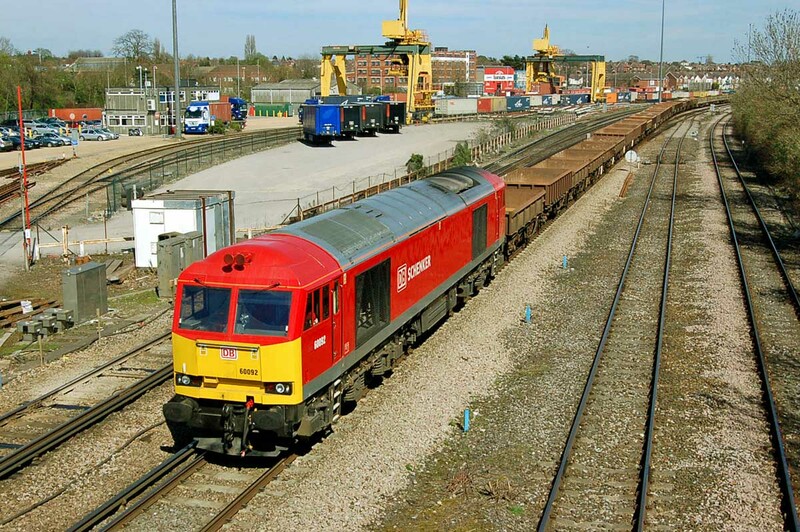 66020 having departed Western Docks on 3rd April, to return to Eastleigh. Image by Ian Knight. 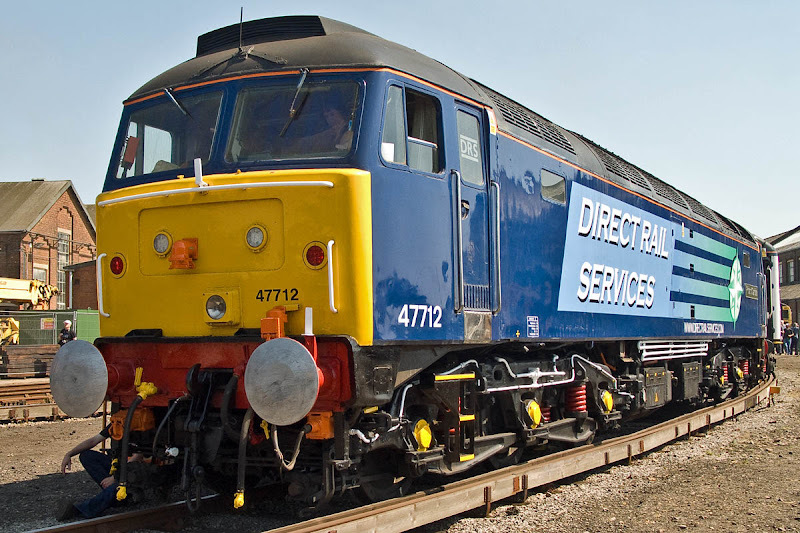 WNXX.com reports that 47747 has been sold for scrap. 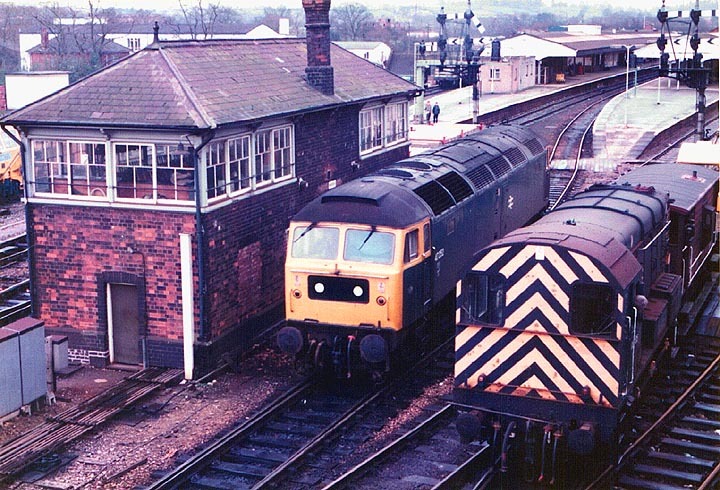 Following withdrawal by EWS it had languished at Millerhill then Crewe for a number of years, at one time said to be for return to use by Riviera Trains. Update: Removed to Booth, Rotherham, 2nd May 2013. 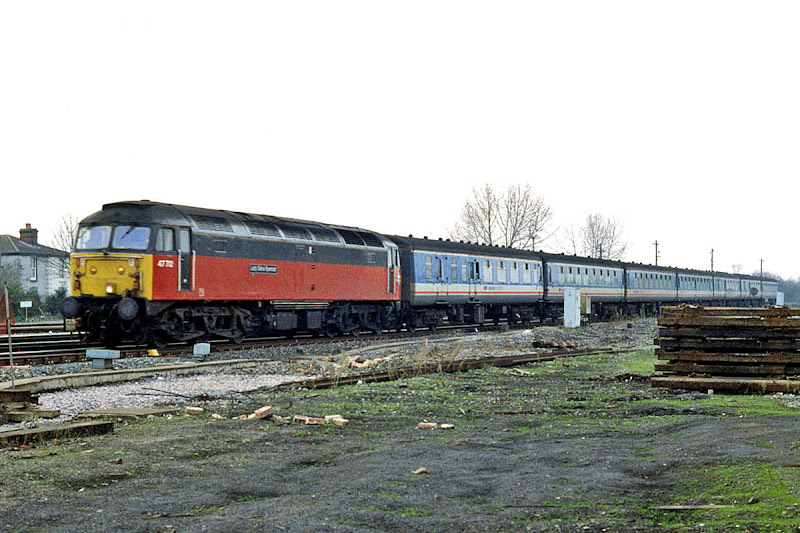 As 47252 at Westbury on 29th January 1983. 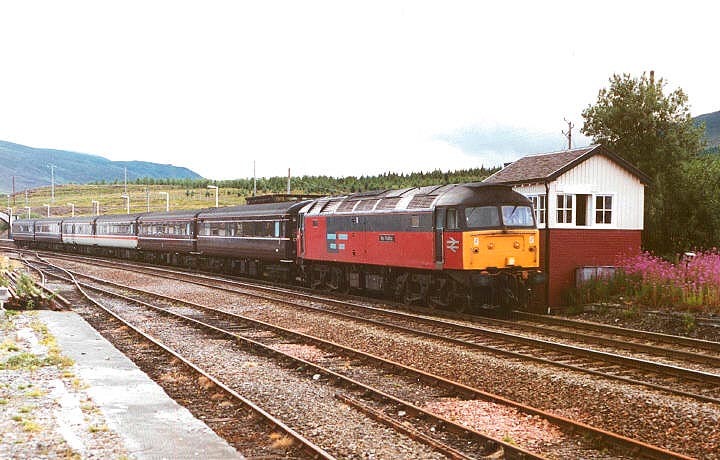 As Res Publica at Dalwhinnie in August 1995, some coached hired from Waterman Railways. 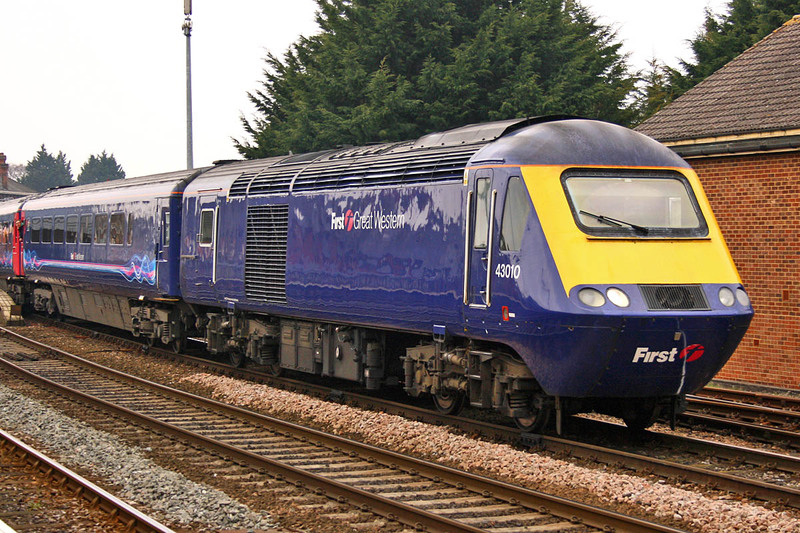 Train may be 1H15 15:40 Edinburgh - Inverness. 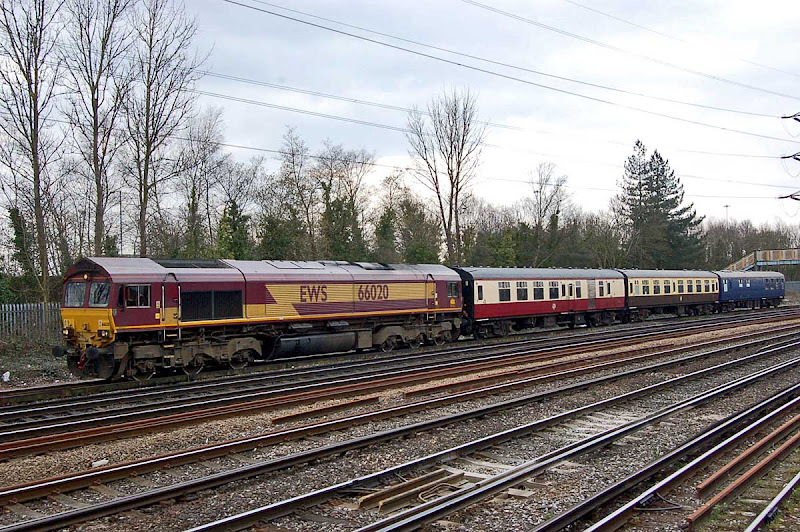 Named Graham Farish at Redbridge with 1M18 14:18 Bournemouth - Manchester on 23rd February 2002 - leased by EWS to Virgin Trains. 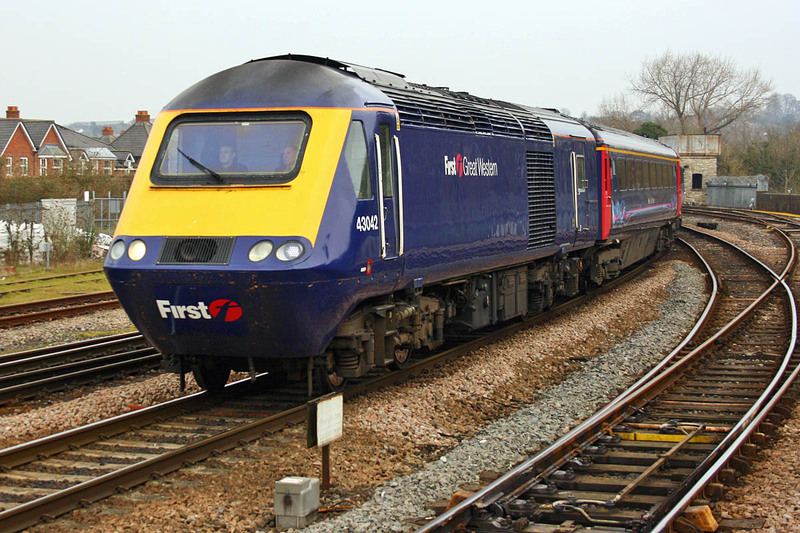 Southampton Airport Parkway earlier the same day, 1O09 08:15 Manchester - Bournemouth. 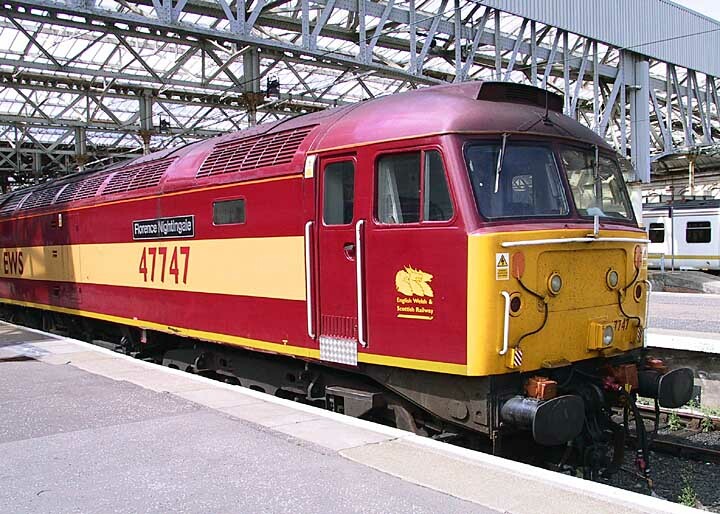 Following a refurbishment by EWS, it was renamed to Florence Nightingale as seen here as 'Thunderbird' at Edinburgh Waverley on 10th July 2003. 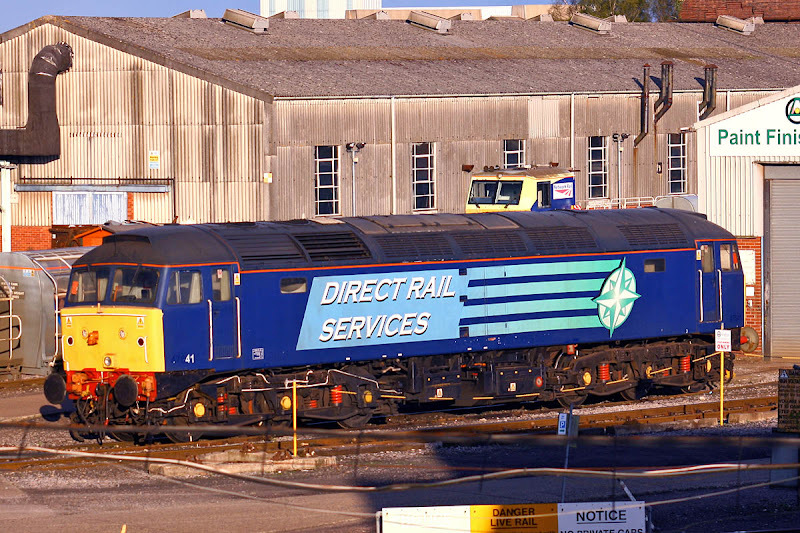 Withdrawn in 2004, sold to Riviera in 2007 from Millerhill Yard, then DRS from 2011. DRS are now unloading their unused 47's with their planned transition to Class 68. 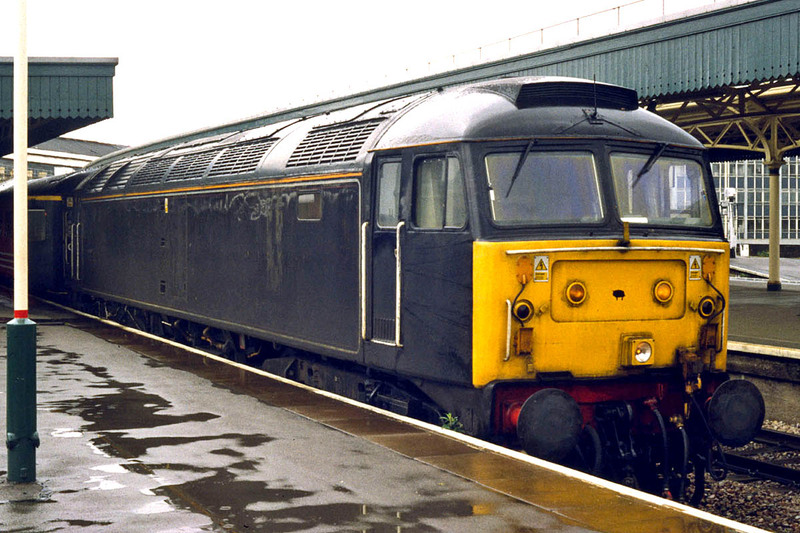 43126 (new May 1979) on 1O43. 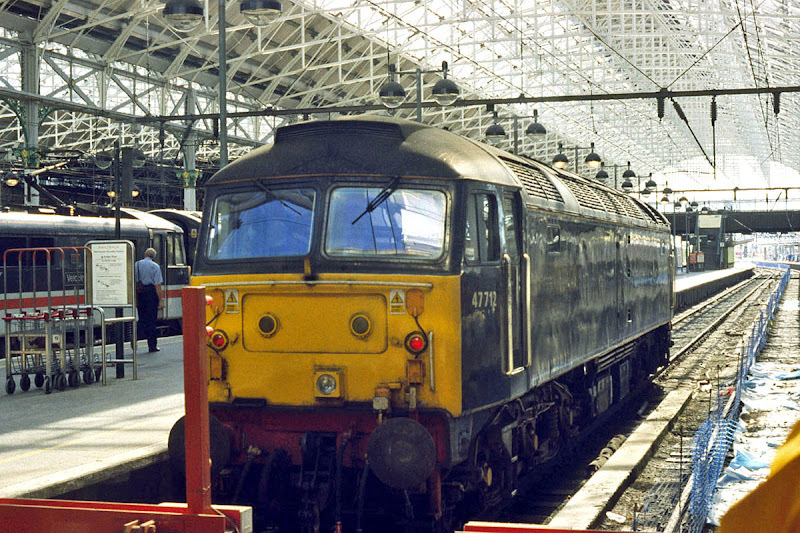 43164 (May 1981) on 1O41. 43010 (April 1976) on 1O40. Although re-engined, now almost as old as the Virgin Cross Country 47/8's were at their end of regular service. 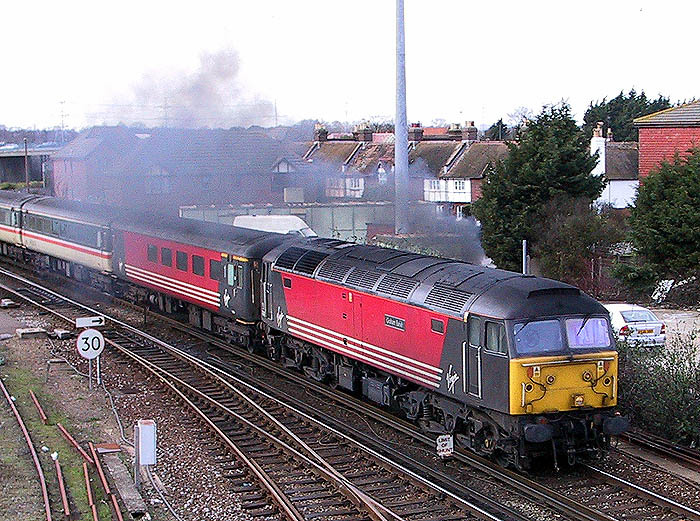 43042 (December 1976) on 1V36. 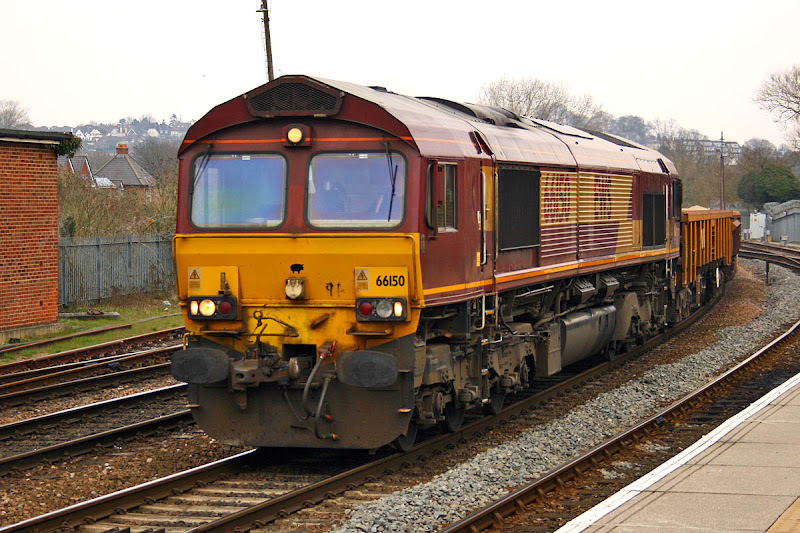 66150 on 6V27 13:28 Eastleigh - Hinksey (diverted via Westbury).